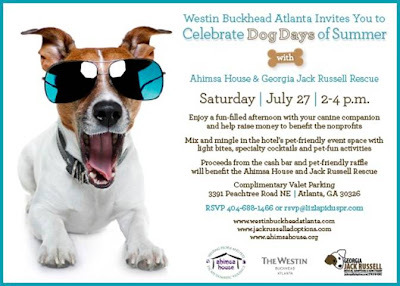 Grab your four-legged companion for another puppy party at the Westin Buckhead Atlanta to help raise money for Ahimsa House and Georgia Jack Russell Rescue continue its good deeds and provide good o'l TLC for our furry friends. WHO/WHAT: The Westin Buckhead celebrates "Dog Days of Summer" to benefit Ahimsa House and Georgia Jack Russell Rescue in its pet-friendly hotel. Enjoy a fun-filled afternoon with your canine friend and a chance to win a Westin Heavenly Dog Bed, a Pampered Pooch Package from Barking Hound Village, a portrait session and much more. Mix and mingle with specialty cocktails and light bites while your pup enjoys pet-friendly libations (water), dog treats and leave with a doggie gift bag. Proceeds from the raffle and cash bar will benefit both organizations. The event is free and open to the public. RSVP at rsvp@lizlapiduspr.com. WHEN: Saturday, July 27 from 2 – 4 p.m.
WHERE: The Westin Buckhead Atlanta 3391 Peachtree Road N.E., Atlanta Complimentary Valet Parking.